is the United Kingdom's founding cat club dedicated to the Egyptian Mau breed. The clubs aims and objectives are to develop and promote the Egyptian Mau in the United Kingdom. The Egyptian Mau Club is a friendly club that informs, supports and advises owners, exhibitors and breeders of Egyptian Maus. The club welcomes new members from both the UK and overseas. For more information on the club and how to join us click here. The photos show the three colours of Egyptian Mau that are recognised in the UK - bronze, silver and smoke. 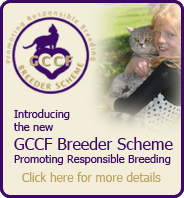 For more information about the different colours see the facts & figures and genetics pages. This site is aimed at our existing members, potential members and the wider community who are interested in learning more about the Egyptian Mau whether you are interested in showing, breeding, having a Mau as a beautiful and stunning pet or you simply want to learn more about the breed we hope you will find helpful information on our site. If you are unable to find what you are looking for, feel free to contact one of our committee members who will be pleased to help you. The Egyptian Mau Club is a member of the UK's premier governing and registration body, the Governing Council of the Cat Fancy (GCCF). Welcome to the website of International Cat Care a charity dedicated to improving the lives of all cats. On our website you will find advice for cat owners, cat care professionals and the veterinary profession, as well as information on the welfare work we do across the world, and the important campaigns we run. Details of the shows and other events of the GCCF for the next 12 months. Information on the Egyptian Mau Breed.